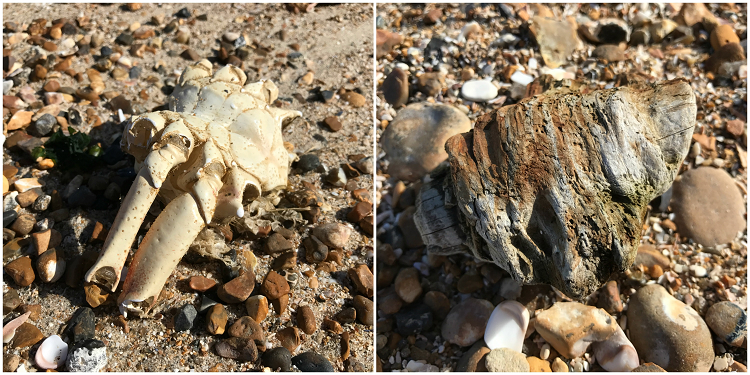 As the weather slowly starts to become warmer and Spring is on the way, I thought I'd write a post about my walk along the beach last week, as a follow up to the same beach walk in February. It was a lovely bright and sunny day with plenty of blue sky and a stiff breeze. I walk along the sea front at Goring beach in Worthing, and then along Goring Gap. I've walked along the beach when the wind has been up before, but it was really blowing today and as usual the kite surfers were out in force. They are very brave, it looks freezing out there! I used to have a colleague who once said that one of the things he loved about the beach was that every time you were there you saw something different. He was quite right and there's always something interesting to spot - today it was this kite surfer on the beach being filmed by his camera team, I wonder what they were up to! Although this part of the coast is known for its pebbly beaches, as you walk west from Worthing the tide doesn't need to be that far out to expose some sand, and it was looking particularly yellow and inviting today in the sunshine. I must bring the children back out this way in the summer with buckets and spades! I love the contrast between the pebbles, the sea and the sky. These little wispy bushes are very pretty too, I've no idea what they are but they are along the top of the beach all the way into Worthing. In places the path meanders through some little tunnels of twisted branches, and a welcome shelter from the wind. I'm always hunting for treasures on the beach, and today I spotted part of a dead crab which must have been huge when it was alive. I'm a bit squeamish about bits of crab on the beach so I didn't touch it, but I couldn't resist bringing home this beautiful bit of driftwood, I'm not sure what for yet but I want to make some kind of beach display in the house somewhere and it will make a nice centerpiece. I feel so lucky to have this beautiful coastline right on my doorstep!